Today, as I write this, 4.3 million people in Scotland are voting in a referendum on whether they should separate from the United Kingdom. I’ve been following the debate in Scotland more closely than I thought I would. For one thing, I have quite a few friends in the UK and this impacts them directly. But if it were only that, I’d probably give it a cursory amount of attention and move on. Of course, it’s more than that. As a Quebecer, this issue is close to my heart. In many ways, it feels all too familiar. And I’ve come to realize that the stress level I feel over this whole thing has very little to do with Scotland, and everything to do with reliving the unresolved fear and uncertainty and anger that I have over the 1995 Quebec referendum. Call it PRSD: Post-Referendum Stress Disorder. On referendum night in 1995, I sat with my family and watched as the ballots were counted and the results came in. I was fifteen years old — too young to vote, but not too young to understand the significance of what was happening. I knew that my future, and the future of everyone I knew, was being decided by people other than me. I felt angry, scared, and helpless — that a 50%+1 plurality of people who were nothing like me could potentially steal my country, my nationality, my passport, my identity as a Canadian. One third of my high school class moved to Ontario that year. My parents talked about doing the same if Quebec separated. I’m a fourth-generation Montrealer, and I was terrified that I would lose my home and my life and everything I knew and held dear. I remember watching the counts tally across three different TV screens — there was no social media back then — and seeing the vote count flip back and forth between “yes” and “no” so often that I bit my nails right down to the quick. And then, I remember the enormous relief when the votes were in and the result was a narrow victory for the No side, only to have that relief shattered by the infamous Parizeau “money and the ethnic vote” speech, and to understand that to some people, I would forever be an outsider in my own home. It’s a terrible feeling at any age. And it has certainly left its scars. Now, flash forward almost two decades, and it feels like the Scots are in much the same place as we were in October 1995. Like in Quebec, support for independence in Scotland was low; only a few months ago, nobody took the threat of separation seriously. As in Quebec, the polls have swung considerably in the past few weeks and days, to the point where it’s too close to call. One poll I saw even had the breakdown of support at 49.4% Yes, 50.6% No — exactly the result of the 1995 Quebec referendum. (Not counting all the fraudulently rejected “No” ballots. But I digress.) As in Quebec, Scotland feels alienated politically, an island of leftist views swarmed in a sea of Tory right in the rest of the UK, just as we have been many times — most notably in 2011, when Quebec’s Orange Crush happened at the same time as the RoC went Tory Blue. As in Quebec, the Yes side in Scotland has managed to sell a dream of an independent future to a population that is weary of being ignored by the federal government. As in Quebec, the UK government woke up to this threat very late, and is now scrambling to make a series of promises to try to talk Scotland into staying. The similarities are not lost on Quebec separatists. Option Nationale leader Sol Zanetti (who?) made an asinine video, full of fact-twisting, factual errors and just plain ridiculous logic, urging Scots to vote yes. Several PQ MNAs, including leadership frontrunner Pierre-Karl Péladeau, have made their way to Scotland to watch the results come in — and, presumably, to try to use them as a way to rekindle the sovereignty debate here at home. Jean-François Lisée is heralding Scotland as a “shining example” for Quebec nationalists. It’s almost as though they don’t want to remember that Alex Salmond snubbed and embarrassed Pauline Marois when she went to visit him last year. He wanted nothing to do with her. No fool, Salmond has certainly studied and learned from Quebec’s referendum process, but really didn’t want to associate his potentially successful movement with Quebec’s twice-failed one. Who could blame him for that? Last April, a majority of Quebecers decided they, too, want nothing more to do with Marois or her PQ, either. Since 1995, support for sovereignty here has plummeted, and hovers around the 30% range. We voted the PQ out and the Liberals in this year, not due to any love for the Liberals, but because PKP said the R-word and Quebec panicked. We want nothing more to do with referendums. Been there, done that, got the t-shirt. Twice. We’re sick and tired of it. Heck, even the PQ leadership candidates seem to recognize how this has turned into a political third rail, promising “ten-year plans” and lots of delays and really, anything-but-referendums. They have PRSD, too. But now, the PQ has seen the perfect opportunity to rekindle the sovereignty flame from the ashes. They’re projecting, of course. They’re making this out to be all about them, when in fact, it has nothing to do with them. But then, I’m guilty of the same thing. The truth is, I’m inclined to support the No side in the Scotland debate, not for any specific reasons related to Scotland or its issues, but because I’m projecting my own experiences as a Quebecer onto their debate. My sympathies lie most with the (by most counts) roughly half of the people in Scotland who want to stay a part of the UK. I know what it feels like to have your country almost taken away from you, to be at risk of losing your home and nationality and identity. I know those feelings of helplessness and fear all too well. And the people in Scotland who are surely feeling much the same way today are the ones who are most in my thoughts. 1. Scotland’s case for independence makes more sense economically. Figures don’t lie but liars figure, so all of these numbers are going to be politically loaded and subject to debate. But by most accounts, Scotland — with its rich offshore oil reserves — pays more into national unity than it receives. Quebec is quite the opposite; we’re a “have-not” province in federal equalization payments, receiving more from federalism than we pay in. An independent Scotland would face serious questions about international treaties, EU membership, currency and monetary policy… there’s no doubt of that. But their case for independence is stronger simply due to the fact that the UK stands to lose more by having Scotland leave. 2. Scotland’s brand of nationalism isn’t about ethnic origin. One of the greatest successes of the Scottish independence movement is that it’s inclusive of all ethnic minorities. Unlike Quebec, Scotland hasn’t created a brand of nationalism that centres on “us” versus “them”. Its brand of nationalism is big-tent inclusive, and centres more on economic and political self-determination than on language or culture. The racism component is missing, making this debate far less ugly than ours. If the No side wins by a narrow margin, don’t expect any infamous “money and the ethnic vote” comments from Alex Salmond. Then again, the cynics out there could note that our first referendum in 1980 had far less of this attached to it; that many anglophones and minorities who voted for Rene Levesque in the 70s would never vote for the likes of Parizeau, Marois or Drainville today. Our movement devolved. Let’s hope Scotland’s doesn’t. 3. Scotland’s question is clear(er). The question on Scotland’s referendum ballot has six words: “Should Scotland be an independent country?” Contrast this to Quebec’s convoluted question in 1995: “Do you agree that Québec should become sovereign, after having made a formal offer to Canada for a new economic and political partnership, within the scope of the Bill respecting the future of Québec and of the agreement signed on 12 June 1995? No wonder that 4 in 10 people who voted Yes in the 1995 referendum actually believed that it meant that Quebec would stay in Canada. One can only imagine how poorly the Yes side would’ve fared with a clear question. And the subsequent Clarity Act, which turned Stephane Dion into Public Enemy #1 among Quebec sovereigntists, only proved how scared they were of actually asking a clear question. Now, arguably, there are very real questions about what an independent Scotland would look like. But at least they’re asking the question the way it ought to be asked. 4. Scotland has been independent before. 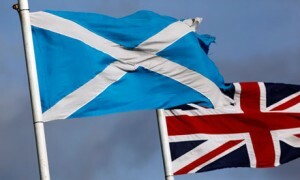 Scotland was an independent country for 800 years, until it joined the UK in 1707. Sure, you could argue that since it has never been independent in the modern era, that doesn’t matter. But Quebec has never been an independent country — and probably never will be. There’s a big difference between the country of Scotland (and yes, I use that word deliberately; regardless of today’s outcome, the four constituent countries of the UK are, in fact, countries) and the province of Quebec. Creating a new country is a different kettle of fish from restoring one that has such a strong historical basis. 5. Europe has many small countries; North America has three big ones. An independent Scotland would be one of four dozen European countries, half of which have smaller populations. If it were to join the EU and other trade organizations (complicated due to Spain/Catalonia and other objections, but not impossible), it wouldn’t be out of place or desperately overshadowed. It could hold its own and pull its own weight, and be taken seriously among its neighbours. Quebec, on the other hand, is a province of 8 million people living on a continent dominated by three main countries — the US, Mexico, and Canada — with a collective population of 500 million people. Canada is already the smallest of the three population-wise and often has trouble negotiating on even footing with our neighbour to the south, which is ten times our size. An independent Quebec would quite simply be drowned out by its trade partners and neighbours, who already see us as an expensive afterthought market for trade and commerce and certainly would even more so if we were to be independent. Ultimately, this debate isn’t our debate, regardless of how familiar it may feel to us. I’ll be watching with interest and hoping for a No vote. But whatever happens, it would serve us well to remember that, for once, this really isn’t about us. And that’s a good thing.